Today my kids’ school had a Bake Sale for Pink Shirt Day and the theme, of course, was to have pink items for sale. The funds raised are going to be donated to Winnipeg Harvest and their Operation Donation Food Drive for Manitoba kids. My daughter has a young girl in her class that has a gluten free diet. Back in October when my daughter’s birthday came around I found it a bit of a challenge to get a nut free and gluten free choice for a class snack. I was thrilled to find out that a treat my husband introduced me to, from Kraft, was not only allergen friendly but something kids would enjoy and, most importantly, fun. When the Bake Sale note came home I knew then that I wanted to make these mousses in small shot glasses so there could be a gluten free option to go with the traditional items bake sale items of cookies and cupcakes. I understand that these were quite popular today. My daughter said by the time her class got to go they were all gone. The ingredient list for this is that simple. 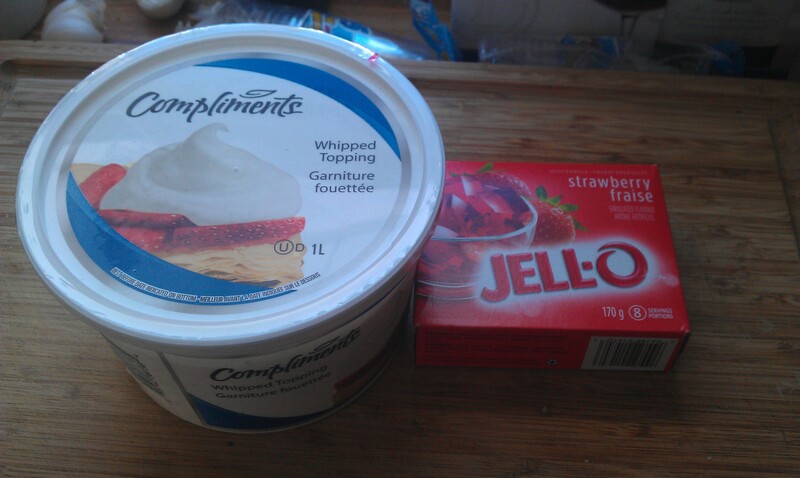 One small tub (or 2 cups from a large tub) of whipped topping and a 170 gram box of Jell-O gelatin. I was going for a pink colouring so I selected the Strawberry flavour. Both of these are also nut free selections. You can make this with any flavour of Jell-O you like and Kraft says you can make it in a mould instead of individual dessert cups as well but I haven’t tried that yet. I think I might try that for summer potlucks this coming BBQ Season. 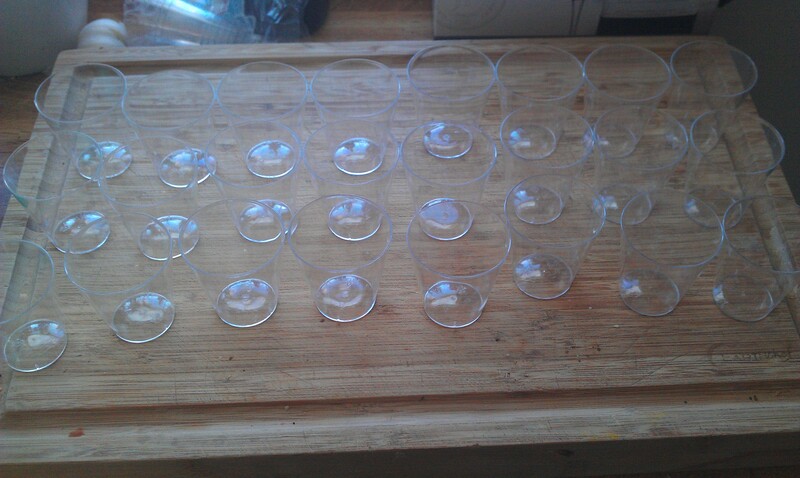 24 shot glasses lined up and ready to go. I picked up 2 ounce plastic shot glasses from Dollarama. I figured this would make for a snack sized serving and the cups would also be able to be recycled when they were done being used. I had planned for 24 of these servings and got 26 in the end with just one batch of this recipe. Jell-O powder and 3 cups of boiling water. I will admit to using my Keurig to help make this. My Keurig has a hot water setting which is handy because it will dispense 8 ounce cups of hot water which is ideal for cup of tea or when you need less than a full kettle of hot water. It also makes for easy measuring and quick work of getting my Jell-O going. Your Whipped Topping doesn’t need to be thawed previous to this point though you can thaw before hand if you choose to. 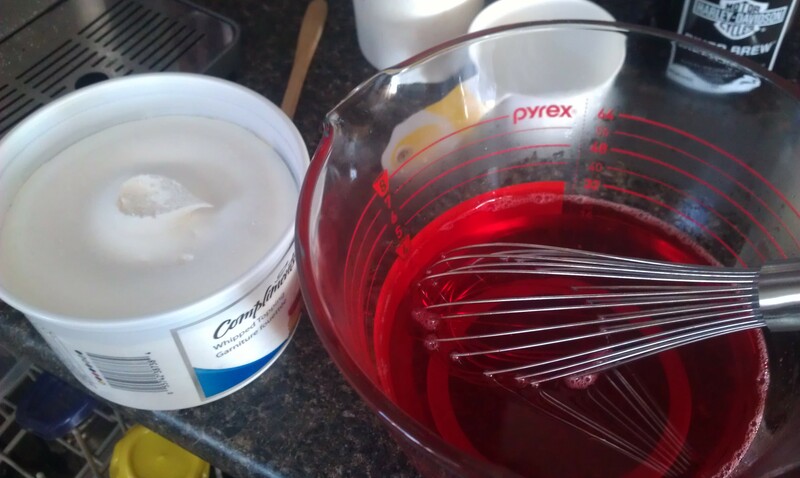 The Jell-O will foam up when you add the topping and you just keep mixing until the topping is completed dissolved in the Jell-O. 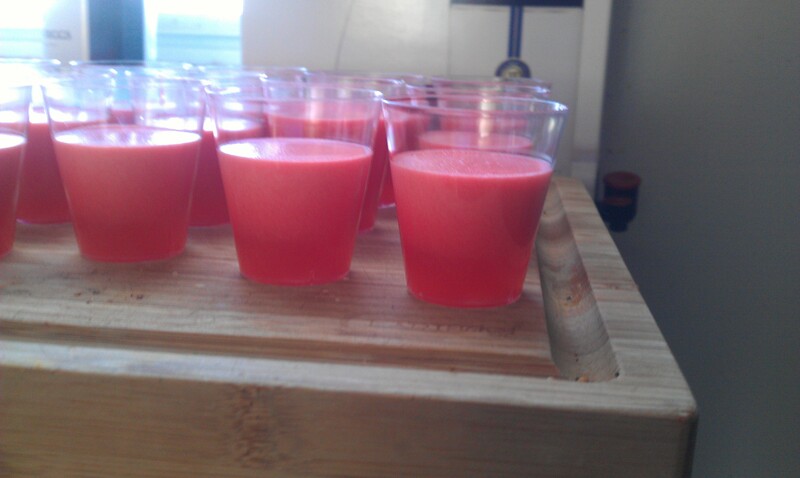 Once you have the topping and Jell-O combined together you want to get it into the cups as soon as you can. It will start to separate into the layers quite quickly so the sooner it can be in which ever dish you are planning to serve it in the better layering you will get from this. Just poured – Can see the layers starting to form and my goal of multiple shades of pink is achieved. After pouring them they need to set in the fridge for at least 8 hours. I had mine in overnight. 2) Pour into 10 glasses or dessert dishes, 1-1/2-qt. bowl or 6-cup mold sprayed with cooking spray. 3) Refrigerate 8 hours or until firm. If using mold, unmold dessert onto serving plate just before serving. This is a quick recipe and ideal for class snacks and almost all dietary restrictions. Tomorrow I will blog about the second item I made for this Bake Sale which was Strawberry Mousse Sugar Cookie Cups. Until then…eat what you enjoy and enjoy what you eat. 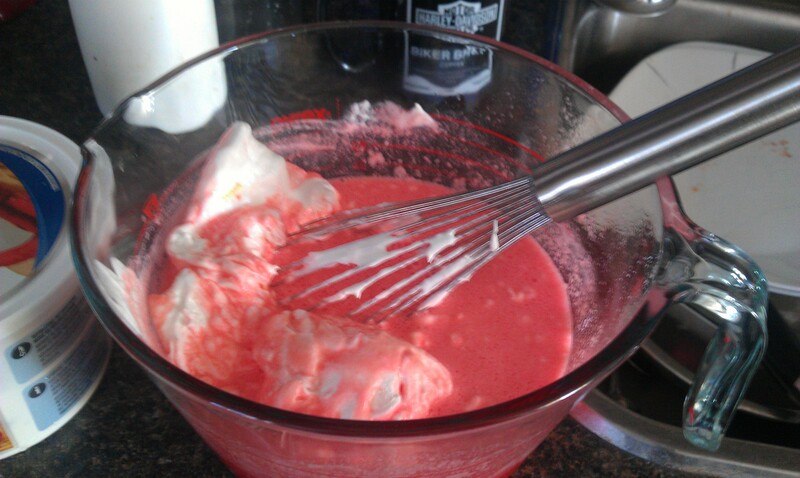 Posted on February 27, 2013 by Shirley Robert	• This entry was posted in Cooking with Kids, Recipes and tagged bake sale, day, dessert, food, gluten free, gluten free diet, Jell-O, kids, Magic Mousse, nut free, ounce plastic, pink, shirt, shot glasses, shots, strawberry, whipped topping, winnipeg harvest. Bookmark the permalink.